"Without exception! Gas ends up in the large intestine from air that is swallowed and from the action of the bacteria that live there. 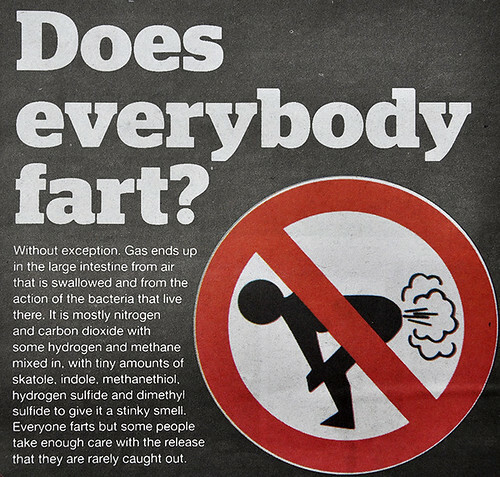 It is mostly nitrogen and carbon dioxide with some hydrogen and methane mixed in, with tiny amounts of skatole, indole, methanethiol, hydrogen sulfide and dimethyl sulfide to give it a stinky smell. Everyone farts but some people take enough care with the release that they are rarely caught out." There you go, release the gas to a glorious sound, it's healthy, totally green act on your part and it does not hurt anyone around you. Ok, maybe a little. Oh, and please don't do that excuse to fart in my presence kio. hahahaha. @KY Chua. Haven't seen that one yet. Is it still available on Youtube? Any link? @KY Chua. Thanks for the link. That thick-whiskered guy looks familiar.